The Urban Monk is a book filled with ideas and ways to think and be to live a life with more value in the modern world. I have read this book a couple of times now and its you can go back to again again, dip into just one section to refresh your memory or to find one new thing to include or to simplify in your lifestyle. The ideas Pedram talks about come from an interesting perspective having lived both extremes of life from faced paced city living to a simple mountain existence of a monk. He talks about the problems of the modern word, how they are affecting us all and how we can find a middle ground that works for us and is sustainable. The problems identified that a lot of us are facing on a daily basis are high stress levels, extreme fatigue, boredom and being stuck in a rut. Studying ancient methods and then trying to apply them modern life just didn’t work and Pedram had to rethink and adapt all the methods to work for us in the here and now. In each chapter he talks through the problem and then gives methods to deal with and counteract them. Chronic stress puts pressure on our bodies and minds and we are constantly in fight or flight mode, our immune systems are depleted and we are getting ill. The solution is to stop the stress beginning rather than treating it bad habits and substances that just take our health worse. Pedram suggests a caffeine detox, visualising your day each morning, Being overcommitted and trying to fit too much into the time we have and this is causing us stress. Rest and relaxation is seen as lazy in our society. We are not switching off and enjoying the present moment. Learning to say no, abstaining from media, and scheduled breaks can all help us master our time. We have a tireless epidemic and we are too busy to even listen to our bodies let alone understand what they need. Focusing on giving our body everything it needs is the answer to feeling good, being healthier and having more energy. You should rest when you are tired, actually give yourself permission to rest, spend time in nature and eat more simple, real food to gain more energy. The unnatural environment we live in pays havoc on our body and brain. Artificial lighting and screens confuse our body clock. We have sleep deficit which makes us age faster, get sick more often, and be more prone to stress and depression. Better sleep can be achieved by cutting down on caffeine, improving blood sugar levels with a healthy diet, less refined sugar, more fresh fruit an vegetables, complex carbohydrates and healthy fats. We should only use our bedroom for sleep and not and stressful or work activities. You can also take on a ritual of the moon to help you offload your thoughts and to do for the next day. This way you can go to bed with a clearer mind. By spending most of our time in air conditioned rooms, with artificial light, unstrap sitting positions and natural rest and recovery cycles we are becoming stagnant. We sit all day at our desks, drive home in our car and then sit in front of a tv then lie down while we sleep. Its no wonder we are gaining weight and becoming so unfit when we are not doing anything to counteract this stagnant lifestyle. Staying active through the day is key and we can do this by standing more, perhaps use a standing desk, setting reminders on our phone to walk, stretch or do some basic exercises, drink more water. We can walk or bike instead of drive where possible, consider working at home for part of the week to avoid wasting time on the commute and even walk while making phone calls to avoid unnecessary time sitting at our desk. Obesity and heart disease is on the rise because of poor diet diet and stagnant lifestyles. Taking a monk’s attitude to eating can help us by being more grateful for our food and taking time to eat it food it then not simply calories but forming rituals in our life. Periods of fasting can also allow your digestive system to take a break. Learning to curb our appetite with fibre, healthy fat, and avoiding refined sugar, we can learn to eat when hungry and get out of the sugar addiction. A good guide for protein is to allow 1 gram of protein for every kilogram of your bodyweight per day. Focusing on mindset and how our lifestyle affects this Pedram talks about how we have lost our connection to nature which is the source of all life. Syncing with nature makes our mind clearer and calmer. Meditating in nature can be great way to get this connection back. Other ways could be to learn outdoor skills, do outdoor sports or activities or even adopt houseplants or have a home garden. Loneliness is a real problem in the world today even though we may be surrounded by lots of people. Some of us may have thousand s of connections on social media but nobody to talk to about their day. Get therapy to heal the past, do things that scare you and get out of your comfort zone. Our attitude to money is completely skewed. The world around us makes us feel we want and need so much but whatever we do have is never enough. The value of money is not understood and it is squandered. Advertising plays a big part in this and it can create a situation were we are constantly under stress because of worry over money and the feeling that we never have enough. If we can learn that money is something that flows. We need it and it is not bad or evil. We just need to learn to watch it and control it. Then we are able to have what we need and use it to benefit us. We can feel lost and need to find our way and our purpose. A way to do this is ask yourself some key questions about what you would do if time, money and location did not matter. This can enable us to see what is in the way of us pursuing what may make us happy and finding a way to make things possible. 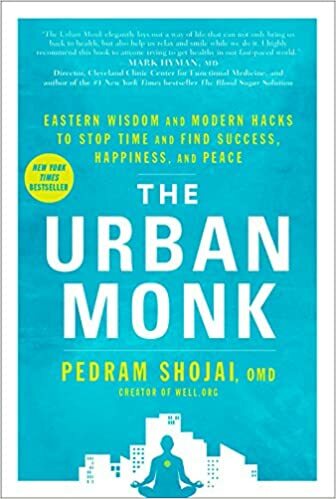 The Urban Monk is someone normal that lives in todays society but has the desire to live a life with more meaning, a happier life where they have more energy, more time and money to put towards their dreams. If we can master our time, be kinder to ourselves and live with less worry and stress and more ease we can then start to create a life filled with good everyday. A final tip is how daily journaling can help us and is one of the best ways to unlock what really make us tick, our desires, hopes and how to be truly happy.